I’m delighted to announce that the special section on psychical research, which I had the pleasure of guest-editing for Studies in History and Philosophy of the Biological and Biomedical Sciences, is now available in its final version for download on the journal website. I’m particularly pleased there is free access to each article till 7th December 2014. To read and download the papers free of charge, please use the individual links provided below; otherwise articles will be behind the usual paywall (with the exception of Katy Price’s paper, which will stay openly available permanently), and you will need to access them via a university library or similar institution with a subscription to the journal. Sommer, A. (2014). Psychical research in the history and philosophy of science. An introduction and review. Studies in History and Philosophy of Biological and Biomedical Sciences, 48, 38-45. Abstract: As a prelude to articles published in this special issue, I sketch changing historiographical conventions regarding the ‘occult’ in recent history of science and medicine scholarship. Next, a review of standard claims regarding psychical research and parapsychology in philosophical discussions of the demarcation problem reveals that these have tended to disregard basic primary sources and instead rely heavily on problematic popular accounts, simplistic notions of scientific practice, and outdated teleological historiographies of progress. I conclude by suggesting that rigorous and sensitively contextualized case studies of past elite heterodox scientists may be potentially useful to enrich historical and philosophical scholarship by highlighting epistemologies that have fallen through the crude meshes of triumphalist and postmodernist historiographical generalizations alike. Noakes, R. (2014). Haunted thoughts of the careful experimentalist: Psychical research and the troubles of experimental physics. Studies in History and Philosophy of Biological and Biomedical Sciences, 48, 46-56. Abstract: This paper analyses the relationship between the ‘elusive’ science of psychical research and experimental physics in the period approximately, 1870–1930. Most studies of the relationship between psychical research and the established sciences have examined the ways in which psychical researchers used theories in the established sciences to give greater plausibility to their interpretations of such puzzling phenomena as telepathy, telekinesis and ectoplasm. A smaller literature has examined the use of laboratory instruments to produce scientific evidence for these phenomena. 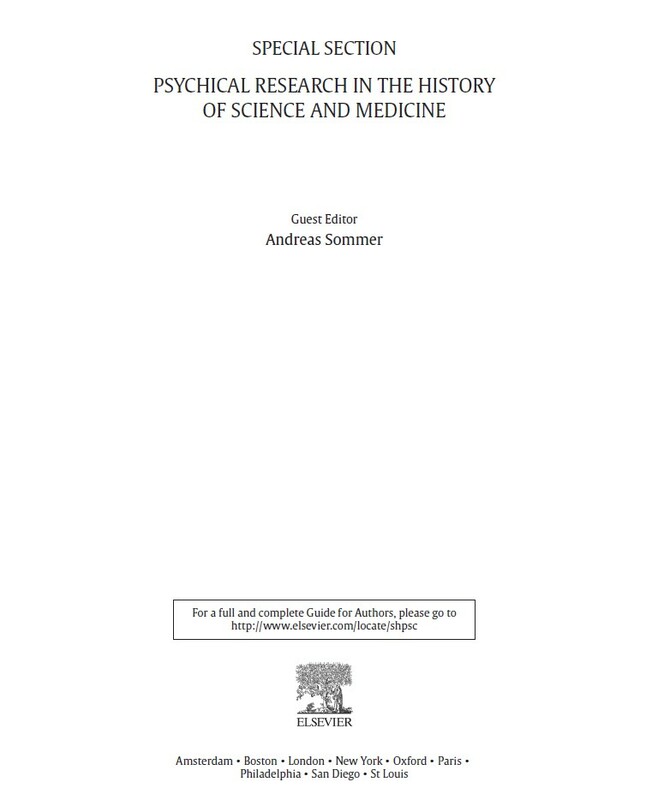 This paper argues that the cultures of experiment in the established science of physics could matter to psychical research in a different way: it suggests that experience of capricious effects, recalcitrant instruments and other problems of the physical laboratory made British physicists especially sympathetic towards the difficulties of the spiritualistic séance and other sites of psychical enquiry. In the wake of widely-reported claims that the mediums they had investigated had been exposed as frauds, these scientific practitioners were eventually persuaded by the merits of an older argument that human psychic subjects could not be treated like laboratory hardware. However, well into the twentieth century, they maintained that experimental physics had important lessons for psychical researchers. Delorme, S. (2014). Physiology or psychic powers? William Carpenter and the debate over spiritualism in Victorian Britain. Studies in History and Philosophy of Biological and Biomedical Sciences, 48, 57-66. Abstract: This paper analyses the attitude of the British Physiologist William Benjamin Carpenter (1813–1885) to spiritualist claims and other alleged psychical phenomena in the second half of the Nineteenth Century. It argues that existing portraits of Carpenter as a critic of psychical studies need to be refined so as to include his curiosity about certain ‘unexplained phenomena’, as well as broadened so as to take into account his overarching epistemological approach in a context of theological and social fluidity within nineteenth-century British Unitarianism. Carpenter’s hostility towards spiritualism has been well documented, but his interest in the possibility of thought-transference or his secret fascination with the medium Henry Slade have not been mentioned until now. This paper therefore highlights Carpenter’s ambivalences and focuses on his conciliatory attitude towards a number of heterodoxies while suggesting that his Unitarian faith offers the keys to understanding his unflinching rationalism, his belief in the enduring power of mind, and his effort to resolve dualisms. Kidd, I. J. (2014). Was Sir William Crookes epistemically virtuous? Studies in History and Philosophy of Biological and Biomedical Sciences, 48, 67-74. Abstract: The aim of this paper is to use Sir William Crookes’ researches into psychical phenomena as a sustained case study of the role of epistemic virtues within scientific enquiry. Despite growing interest in virtues in science, there are few integrated historical and philosophical studies, and even fewer studies focussing on controversial or ‘fringe’ sciences where, one might suppose, certain epistemic virtues (like open-mindedness and tolerance) may be subjected to sterner tests. Using the virtue of epistemic courage as my focus, it emerges that Crookes’ psychical researches were indeed epistemically courageous, but that this judgment must be grounded in sensitivity to the motivational complexity and context-sensitivity of the exercise of epistemic virtues. The paper then considers Crookes’ remarks on the relationship between epistemic virtuousness and the intellectual integrity and public duties of scientists, thereby placing epistemic virtues in the context of wider debates about the authority of science in late modern societies. I conclude that Crookes’ researches into psychical phenomena offer instructive lessons for historians of science and virtue epistemologists concerning the complexity and contextuality of epistemic virtues, and the profitable forms that future studies of virtues in science could take. Brancaccio, M. T. (2014). Enrico Morselli’s Psychology of “Spiritism”: Psychiatry, psychology and psychical research in Italy around 1900. Studies in History and Philosophy of Biological and Biomedical Sciences, 48, 75-84. Abstract: This paper traces Enrico Morselli’s intellectual trajectory from the 1870s to the early 1900s. His interest in phenomena of physical mediumship is considered against the backdrop of the theoretical developments in Italian psychiatry and psychology. A leading positivist psychiatrist and a prolific academic, Morselli was actively involved in the making of Italian experimental psychology. Initially sceptical of psychical research and opposed to its association with the ‘new psychology’, Morselli subsequently conducted a study of the physical phenomena produced by the medium Eusapia Palladino. He concluded that her phenomena were genuine and represented them as the effects of an unknown bio-psychic force present in all human beings. By contextualizing Morselli’s study of physical mediumship within contemporary theoretical and disciplinary discourse, this study elaborates shifts in the interpretations of ‘supernormal’ phenomena put forward by leading Italian psychiatrists and physiologists. It demonstrates that Morselli’s interest in psychical research stems from his efforts to comprehend the determinants of complex psychological phenomena at a time when the dynamic theory of matter in physics, and the emergence of neo-vitalist theories influenced the theoretical debates in psychiatry, psychology and physiology. Graus, A. (2014). Hypnosis in Spain (1888-1905): From spectacle to medical treatment of mediumship. Studies in History and Philosophy of Biological and Biomedical Sciences, 48, 85-93. Abstract: Towards the end of the nineteenth century, some Spanish physicians sought to legitimize hypnotherapy within medicine. At the same time, hypnotism was being popularized among the Spanish population through stage hypnosis shows. In order to extend the use of medical hypnotherapy, some physicians made efforts to demarcate the therapeutic use of hypnotic suggestion from its application for recreational purposes, as performed by stage hypnotists. However, in the eyes of some physicians, the first public session to legitimize hypnotherapy turned out to be a complete failure due to its similarities with a stage hypnosis performance. Apart from exploring this kind of hitherto little-known historical cases, we explore the role of spiritists in legitimizing medical hypnosis. At a time when Spanish citizens were still reluctant to accept hypnotherapy, the spiritists sponsored a charitable clinic where treatment using hypnosis was offered. We conclude that the clinic was effective in promoting the use of hypnotherapy, both among physicians as clinical practice, and as a medical treatment for patients from the less privileged classes of Spanish society. De Sio, F., & Marazia, C. (2014). Clever Hans and his effects: Karl Krall and the origins of experimental parapsychology in Germany. Studies in History and Philosophy of Biological and Biomedical Sciences, 48, 94-102. Abstract: Shortly before the outbreak of World War I, the so-called Elberfeld horses, the counting and speaking animals, were among the most debated subjects of the newborn comparative psychology. Yet, they have left little trace in the historiography of this discipline, mostly as an appendix of the more famous Clever Hans. Their story is generally told as the prelude to the triumph of reductionistic experimental psychology. By paying a more scrupulous attention than has so far being done to the second life of Hans, and to the endeavours of his second master, Karl Krall, this article explores the story of the Elberfeld horses as an important, if so far neglected, chapter in the history of experimental parapsychology. Price, K. (2014). Testimonies of precognition and encounters with psychiatry in letters to J. B. Priestley. Studies in History and Philosophy of Biological and Biomedical Sciences, 48, 103-111. Abstract: Using letters sent to British playwright J. B. Priestley in 1963, this paper explores the intersection between patient-focused history of psychiatry and the history of parapsychology in everyday life. Priestley’s study of precognition lay outside the main currents of parapsychology, and his status as a storyteller encouraged confidences about anomalous temporal experience and mental illness. Drawing on virtue epistemology, I explore the regulation of subjectivity operated by Priestley in establishing the credibility of his correspondents in relation to their gender and mental health, and investigate the possibility of testimonial justice for these witnesses. Priestley’s ambivalent approach to madness in relation to visions of the future is related to the longer history of prophecy and madness. Letters from the television audience reveal a variety of attitudes towards the compatibility of precognition with modern theories of the mind, show the flexibility of precognition in relation to mental distress, and record a range of responses from medical and therapeutic practitioners. Testimonial justice for those whose experience of precognition intersects with psychiatric care entails a full acknowledgement of the tensions and complicities between these two domains as they are experienced by the witness, and an explicit statement of the hearer’s orientation to those domains. This entry was posted on Friday, October 24th, 2014 at 11:21 am	and tagged with History of medicine, history of science and posted in Uncategorized. You can follow any responses to this entry through the RSS 2.0 feed.